It has been in the 90s all week long. I have barely wanted to cook anything. Breakfast we have smoothies. Lunch we have salads and cold sandwiches. And dinner, oh dinner you are a hard one. We eat more salads, maybe some sort of raw vegetable noodle dish and barely any protein because I just don't want to turn on the oven. My drink of choice has went from a glass of wine to something frozen, cooling, slushie-like. For the past few months I have gotten really into infusing alcohol and vinegar (drinking vinegar's) for different cocktails. And while the impatient person in me barely survives letting the concoctions infuse for a whole month. I love the moment when you get to strain the liquids and see how it all turned out. So while rhubarb was full in season I made rhubarb shrub and rhubarb vodka. Now I have mentioned this before, but vodka is never one of my go-to drinks of choice. But infusing your vodka with berries, oranges, rhubarb, herbs, anything really, well that is pure fun. Cocktail choices are endless. 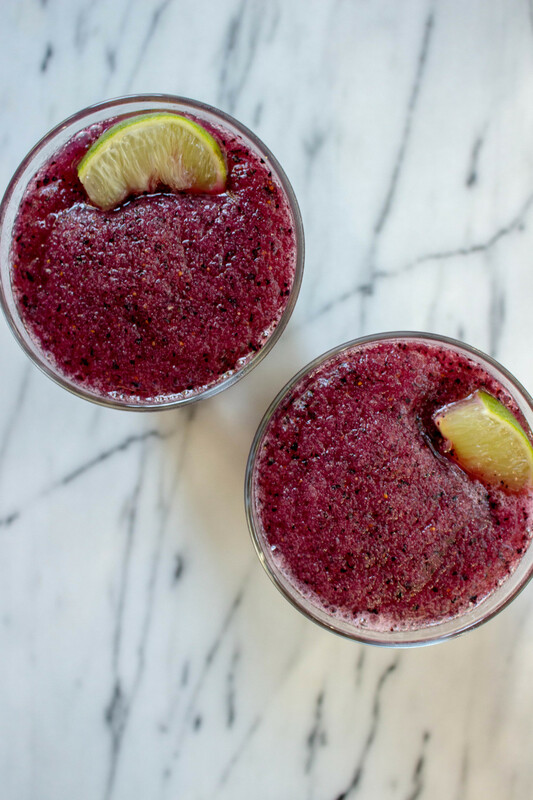 And with this hot weather, might as well bring out the blender and make yourself a frozen cocktail. Cheers! Add everything into a large mason jar, place the lid on top and give it a good shake. Store in a cool dark place and shake the jar daily. After 1 month, strain out the rhubarb. Combine all ingredients and blend together until pureed. Taste and adjust quantities, more vodka, more ice, more lime or more agave. Pour into glasses and garnish with lime wedges.